The author, Dee Copeland, with her parents, Bob and Pam Black. 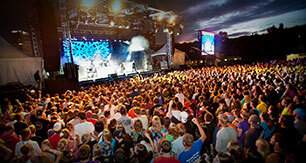 Dee still remembers the day nearly 60 years ago when a Billy Graham Crusade in Sydney changed her family's life. 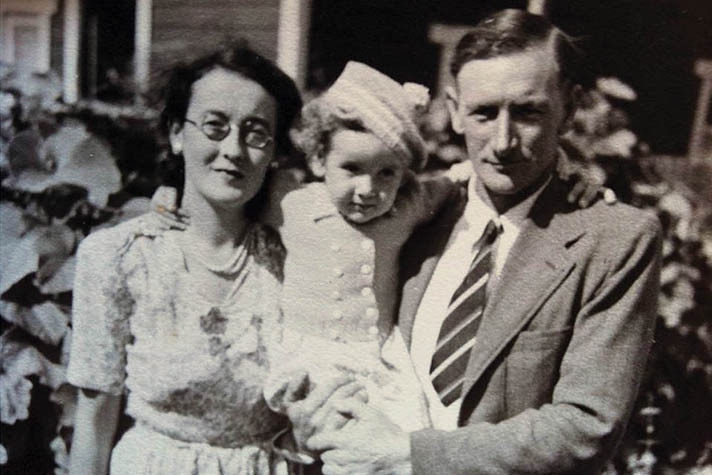 My family emigrated from England to Australia in 1949, when I was 2 years old. We lived on a farm west of the town of St. Marys in New South Wales. My family struggled to make a living, and my parents struggled in their marriage. My mother had grown up in the Church of England and loved God. She had a deep faith in Him and made going to church a priority for my sister, Kathleen, and me. My dad, on the other hand, would go to church occasionally, just to please mum, but he always had something to do on the farm and often didn’t make time for God. As a young girl, I saw what it meant to put God first but also what it meant to put God last. Years went by, and Dad got into drinking and gambling, looking for the quick buck and not caring how his decisions impacted our family. He liked to bet on the Harold Park trots and would go to the races by train. If he couldn’t make it to a race, he would sit by the radio for hours and listen. I could see that his addiction to gambling bothered my mum, so much so that one day I found her crying in the bedroom. When I asked what was wrong, she said Dad lost all their money, and they had no way to pay the bills. However, as I look back on it now, I can see that God provided, as we had cows, chickens and a vegetable garden that brought food to the table. But, I remember how stressed my mum was. She always put on a happy face for my sister and me, but I knew deep down she was hurting. Everything in me wanted my mum to have genuine happiness, so I prayed. I prayed that God would change our situation and my father’s heart. I prayed that He would transform Dad’s heart and ‘make it like butter,’ a prayer my mum often prayed. Not only did I pray but I sang. I would often go for long walks on the farm, climb a tree and sing hymns. My favorite was A Mighty Fortress is Our God! Though I didn’t have a personal relationship with God, I believed in Him. And though I hadn’t always put Him first, I believe He heard my prayers, as one day in October 1959, things changed for the better. My mother was reading the Sydney Morning Herald when she saw a Billy Graham Crusade advertisement. Keen to hear Mr. Graham speak at the Sydney Showground, she managed to talk my sister and me into going, though we weren’t sure what to expect. However, in order for us to go, Dad had to come. Through some miraculous intervention by the Holy Spirit, Mother persuaded him, and he agreed to take us to the Crusade. We caught the same train that Dad would take to the racing track and then caught a bus to the Showground. It was a cloudy day, and rain was predicted, but it didn’t stop the crowds from coming. The parking areas were packed, as tons of people anxiously waited to get inside while talking to each other about how amazing this speaker was. I didn’t know what the night had in store, but I was excited. 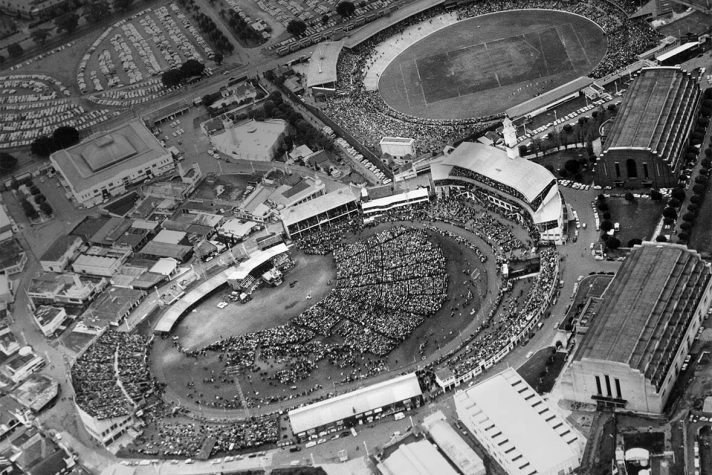 An aerial view of Billy Graham’s 1959 Crusade at the Sydney Showground. After the doors opened and we found our seats, we were given a My Decision card. I can’t remember exactly what Mr. Graham said, but I do remember it touched my heart, especially when he said that God loves me unconditionally and sent His only Son, Jesus, to die for my sins. I remember thinking No one has ever done that for me—ever! Then Mr. Graham said, “You come now, come down from wherever you are and make a decision for Christ today … don’t delay, come now!” As he said this, the choir softly sang Just As I Am while hundreds of people rushed down to the front where Mr. Graham was preaching. It poured down rain as we got up as a family and went forward from the open stalls. We got soaked, but Jesus came into our hearts that night and saved my whole family! I was 13 years old at the time, and from that point on, my life and my family’s lives changed. Dad gave up drinking and gambling and was a different person, Mother was genuinely happy, and we all did the follow-up course. How will your faith impact future generations? Get your life on the right track by following Christ today.